The currents in San Francisco Bay are generated by the tides. At several locations in the Bay, currents can be as strong as six knots. As a recreational paddler, you paddle about three knots—four if racing or terrified. 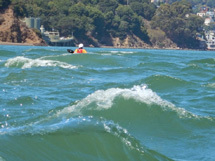 Use caution when paddling in a strong current; you could lose control of your boat and capsize or get swept out the Golden Gate. The strongest currents occur where the water masses streaming in and out of the bay are funneled through a constriction, like under the Golden Gate Bridge and through Raccoon Strait on the north side of Angel Island. During the course of each month, tide differences are highest, and currents therefore strongest, during and shortly after full moon and new moon. Several places in San Francisco Bay are known for their tidal races (sometimes referred to as “tide rips”). The most prominent are Yellow Bluff on an ebb (shown in photo), Raccoon Strait off Pt. Stuart (mostly on an ebb, sometimes on a flood), and around Alcatraz Island. The locations of these tidal races usually coincide with abrupt changes in the topography of the ocean floor. Playing in the races can be exhilarating, fun, and skill-building. If you don’t like it rough, it’s best to avoid these areas during strong currents or other adverse conditions (like opposing current and wind direction). It is important to learn how to read tide and current tables. See the article on tides and currents in the Articles section of this web site. Reading the water and knowing how to paddle across a current are important skills when paddling in the Bay as well. And one last note: Check conditions, including tides and currents before every trip. The Trip Planner is an excellent tool to do this. Don’t rely on the trip initiator to have it all figured out!